Having tasted quite a lot, but never enough, Pinotages in the past three weeks here in the Cape I’ve found it really difficult to pick a wine of the month this time. So many stand out, so many have been delicious and enjoyable. 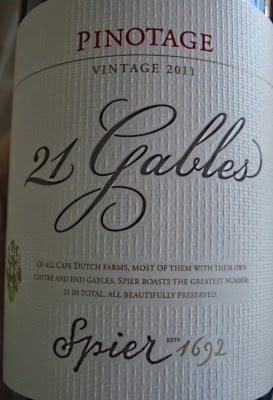 But a decision had to be made and by a whisker Spier’s premium ‘21 Gables’ 2011 is my choice. I enjoyed it with lunch at the wine farm’s ‘Eight’ restaurant – a farm to table operation where the menu changes from day to day according to what the farmers bring in from the fields. We had an excellent waitron and were impressed that the Pinotage was served chilled. This is a very modern style of Pinotage, restrained and elegant but with oodles of fruit underneath. Four and a half stars in Platter and worthy of five. I’d have bought a case there and then if I could carry them home with me. 160 Rand at the cellar door. Congrats to Frans Smit and his team! Beyers ‘King of Pinotage’ Truter’s winery is a temple to the Pinotage grape. The winery logo on walls and bottle labels is a distinctive bright red Pinotage leaf. The Red Leaf restaurant serves Pinotage flavoured foods, including the famed Pinotage Burger with its dressing of Pinotage onion jam. In the tasting room you can sample and purchase red, white, pink and sparkling Pinotage wines, and also fortified port-style wines fortified with Pinotage brandy. If it can be improved by Pinotage (and few things can’t) then Beyers has done it -- with ice cream, Pinotage jam, and Pinotage infused meats and sausages. Recently Beyers was on a marketing trip to Belgium, rightly famed for the range and breadth of its beers. One evening, off duty and enjoying a glass of Kriek lambic ale, inspiration struck. Once back home he booked himself on to a craft beer-making course. Kriek ale is steeped and fermented with cherries in a process that pre-dates the addition of hops. What beer drinkers have been sadly lacking, however, is a Pinotage beer. But salvation is on hand. 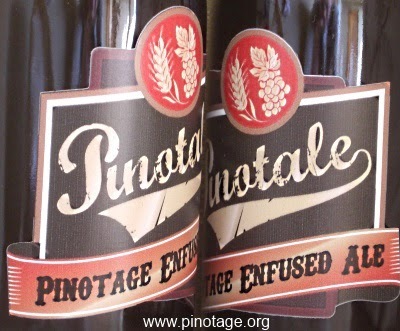 Shortly Beyers will launch the world’s first Pinotage beer, provisionally titled Pinotale. It will be available at first at Beyerskloof winery but Beyers tells me that he is in discussions with a large brewing company who are keen to distribute it nationally. First South Africa: next the World! Over at Top Wine SA, Mike Froud has posted his annual list of top wines based on the ten previous years results from various competitions and ratings. also make Top Wine SA’s 2014 Red Wine Hall of Fame for having received top accolades from the top tasting panels for at least eight vintages during the past 10 years.